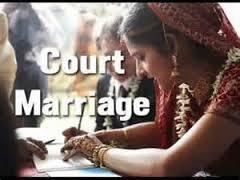 We are the Sole Court Marriage Law Firm in Pakistan, providing Court Marriage/Nikah on line/Nikah on phone services. Hundred of Couples through out the World, mostly from Pakistan, UAE, USA, Canada, UK, Saudi Arabia, Indonesia, Malaysia, Germany, India, Kuwait, and in many more countries enjoying their Happy Family lives after availing our Court Marriage Nikkah . Now a days, rise in education level has changed the way of life in Pakistan but still our society is conservative on this particular issue of court marriage. Parents also treats their child as a property of their family rather than a living person. 1	Both should have valid CNIC, in case if non-availability of CNIC then passport of Matriculation certificate or Form can also be used. 2	There should be two marriage witnesses, in case you are unable to manage then we can help with that as well. 3	Six passport size photos of the bride. 4	Free will affidavit from Girl’s side. 5	In case of 2nd marriage then valid Divorce Certificate or Death Certificate of deceased partner. •	Translation of Nikkah Nama From Urdu to English & Arabic etc.